Look, we’re all for snoozing our alarm clocks until the cows come home, but your boss might see it another way. 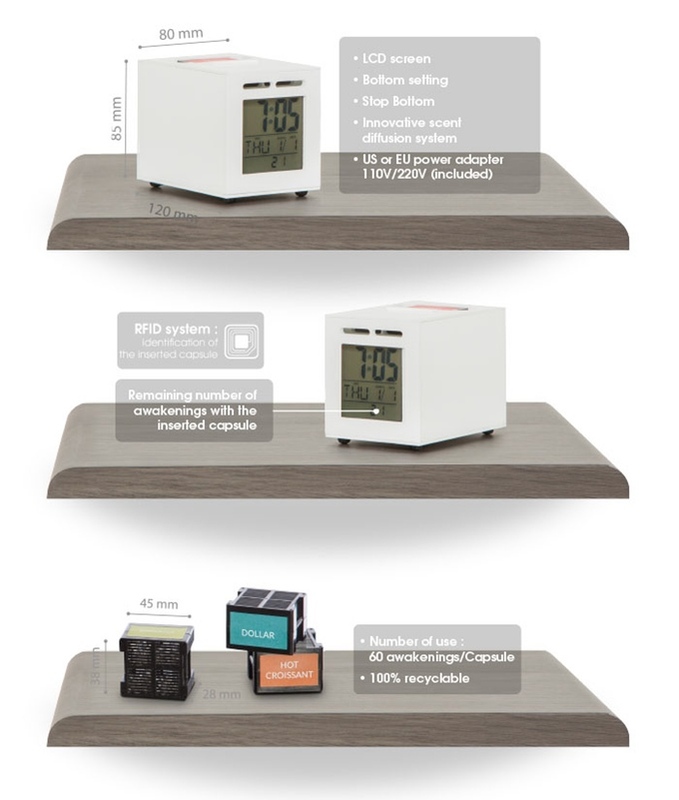 There’s a number of products on the market to help you fight the almost irresistible appeal of the endless snooze cycle, and the Ruggie is one of the nicer one’s we’ve come across. It’s a pressure sensitive rug that contains a loud alarm that won’t turn off unless you step on it for 3 seconds. You can load your own custom tones, and set the wake up time through hidden buttons on the side. The soft memory foam will cushion your feet as you step out of bed and launch you onto a productive day, right on time. It’s a $79 pledge on Kickstarter, with the price going up to $99 once it hits retail. Delivery is in September of 2016. Hot on the heels of the alarm clock that physically tosses you out of bed comes news of the alarm clock that slaps you awake. 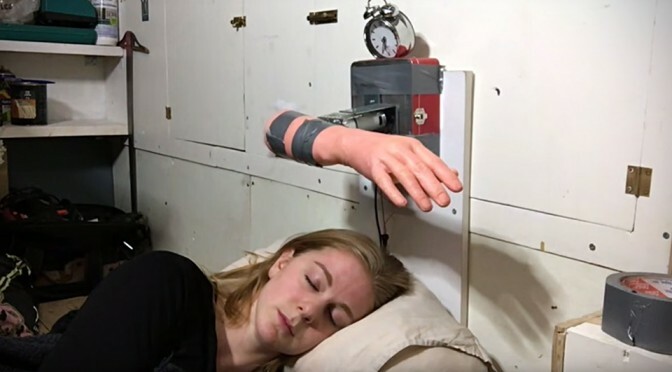 Because placing your alarm out of reach and forcing yourself to stand up isn’t good enough for some, electronics tinkerer Simone Giertz created The Wake-Up Machine, a device that literally slaps your face in the hopes of getting you out of bed. “It is a composition of a rubberized fake arm, a standard alarm clock and a powerful brushed DC motor that runs at 165 rpm – rigged to an Arduino UNO.” Watch the video below to get a breakdown of what Simone’s made. Have trouble getting up in the morning? 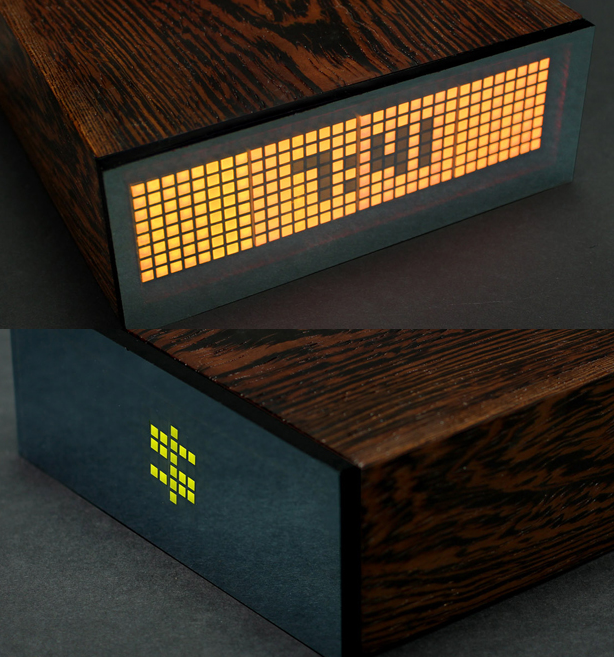 You should seriously consider Clocky, the Alarm That Runs Away. Put it on your night table and set your alarm as you normally do. But when the time comes, it wakes up and rolls right off, forcing you to get up to go turn it off. Notoriously an anti-morning person? 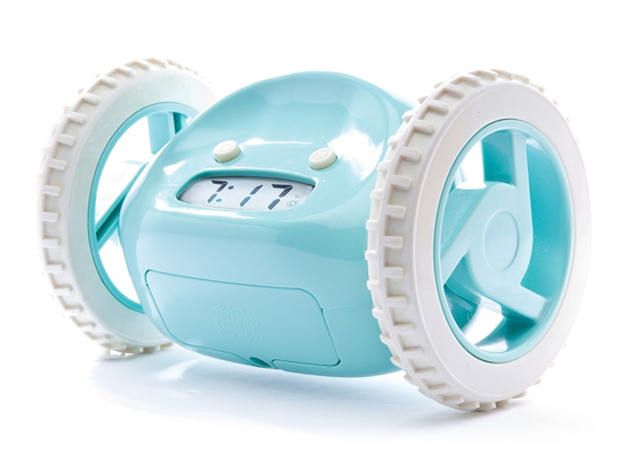 Not to worry, an alarm clock that won’t take snooze for an answer has arrived. Clocky not only pollutes the air with obnoxious snooze-resistant noise, but runs and jumps away from you in the process. Finally make that morning workout, be the first in the office or start the line at your local coffee cart—Clocky will make sure you rise and shine as planned. It’s normally $39, but with today’s deal it’s $34.99. Typical alarm clocks rely on loud, jarring sounds to wake you up. It’s effective, but it’s also a pretty rough way to get your day started. Guillaume Rolland, an 18-year-old French entrepreneur, thought there was a better way to go about it and created SensorWake. 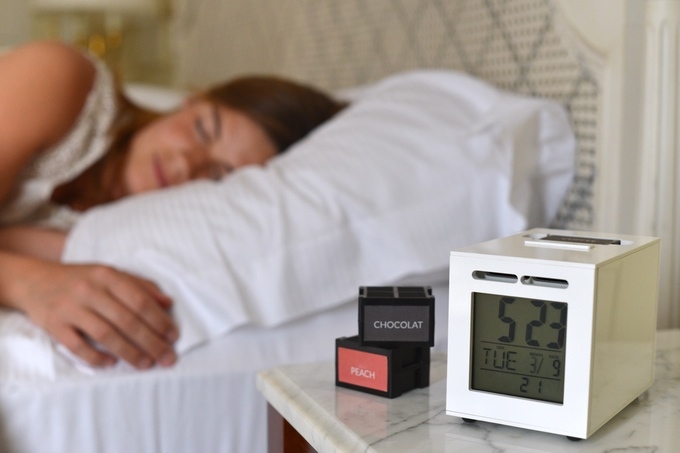 It’s an alarm clock that releases a scent, and in testing is able to wake 99% of people up within 2 minutes. Scents are stored in special replaceable pods, and range in variety from “Continental breakfast: Espresso & Hot Croissant” to “Candy Rush: Sweet peach & Strawberry candy”. If you fail to wake up after 3 minutes, then SensorWake will revert to a backup audible alarm so you don’t miss your important meeting. Each scent pod lasts up to 60 times. You can get in on the action with an $89 pledge, which includes a 2-capsule pack. Sugar and caffeine can’t hold a candle to a shot of adrenaline when it comes to waking you up. 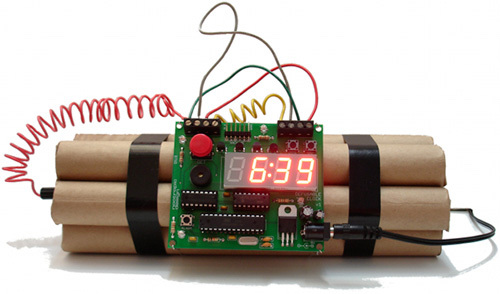 Which is why we feel this bomb-shaped alarm clock, which looks like it was ordered directly from the ACME catalog, would be far more effective than the countless number of alarm clocks we’ve brought you in the past. 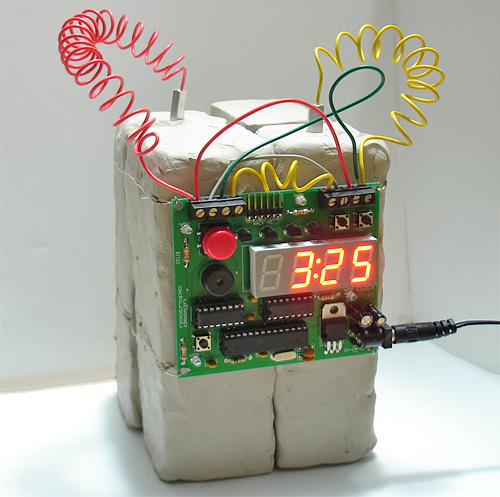 Designed and built by Mike Krumpus from Nootropic Design, when the countdown for the alarm starts you have to snip one of 3 wires to ‘diffuse’ the situation. And every time the countdown begins it’s a different randomly selected wire that does the trick. Now granted, having to replace the wires every single night before going to bed is probably kind of annoying. And knowing the bomb is actually made from paper towel tubes takes away some of the adrenaline producing fear that would help wake you up in the morning. (Even though the clay version pictured below is certainly convincing.) But if it’s fear and adrenaline you’re after I’d suggest packing one of these in your luggage and convincing airport security it’s just a travel alarm. Physically abusing an alarm clock just to get a few more minutes of sleep in the morning isn’t a new idea. But you might feel a little less put off by the idea when the alarm clock looks like one of the lovable characters from Roger Hargreaves’ Mr. Men/Little Miss series. 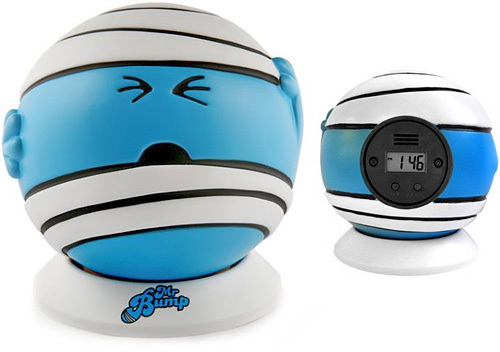 And while Mr. Bump might look too adorable to throw, just remember that pain and injury are his raison d’être. His modus operandi. Without a reason for wearing those bandages he’d just be ‘Mr. Creepy Mummy Fetish’ or something. ~$21 (£12.99) from Truffle Shuffle. By Andrew Liszewski on 06/13/11 • Leave a comment! 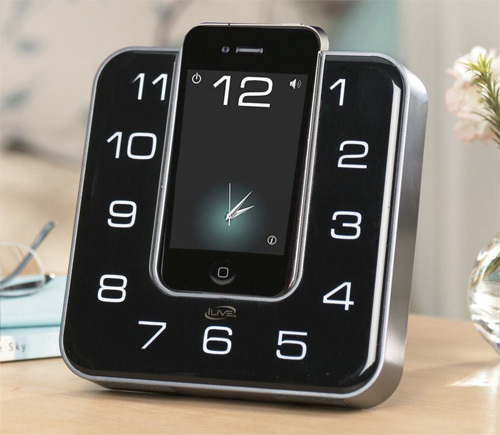 Having trouble seeing the time from afar when using your smartphone as an alarm clock? For the most part, iPhone alarm clock apps use a digital time display that’s larger and brighter than your traditional alarm clock hardware. But you know how people can be. You give ’em an inch, and they take a mile. So if the iPhone’s display still isn’t big enough for you to read in the middle of the night, iLive’s Clock Radio Dock certainly will be. Instead of a digital display, the iLive uses your iPhone as the hands, and the number 12, for a traditional analog clock face. Admittedly the hour, minute and second hands generated by the free accompanying app are a little on the small side, kind of negating the size advantage of the larger clock face. But I’ll still give them points for originality. As alarm clocks go it’s as functional as one would need, with dual alarms that can wake you to music, the radio or a beeping sounds. It’s also got a sleep timer and snooze function, a full function remote and can be yours for just $49.99.